I was at H&M the other day and spotted a new hair cuff. This time, it's in rose gold and has leopard prints too! The hair cuff cost S$7.90. 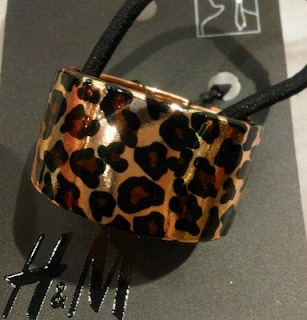 Not very expensive as with the H&M accessories in general, but it's a bit more pricey than the plain hair cuff. a new H&M hair cuff! I decided to do a bit of DIY, and make an inspired one myself. Since I have an extra silver hair cuff, I decided to use the extra one for this project. It's a very simple and fast project. You'll need either markers or nail polish in two colors. For my prints, I decided to use an orange-red nail polish from O.P.I (Tapestry from the Designer Series) and black marker. You can choose any color them or combination- doesn't have to be restricted to two, but I wanted my hair cuff to be simple. The first step is to cover the hair cuff with blobs of nail polish. I randomly dotted and splattered the polish all over the metal. For this step, it isn't necessary to me neat. In fact, the more random and messy it is, the more "natural" the leopard print will look. The nail polish may run a bit, so do take note of the spacing between blobs. Next, wait for the polish to dry. Mine too about 10 minutes to be totally dry, but if time permits, do leave it to dry for a longer time. 30 minutes would be safe! Once the polish is dry, start outlining the blobs with black marker. Again, it doesn't have to be orderly or structured. Do make sure that the outlines and black borders do not touch, else it will be too messy. Once the maker dries, you'll have your very one leopard print hair cuff! Now I have a new use for the extra hair cuff!